Are you fed up of piles of pennies cluttering up your pockets, cubbies and work surfaces? Despite living in an era of contactless payments and handy payment apps, many of us still suffer from jingling handbags and the sound of forgotten change clanging around the washing machine. But all of this spare change doesn't have to be a nuisance. In fact, it can be a real help. At Wink Bingo, we love helping you make the most of your money - mainly through the occasional jackpot! 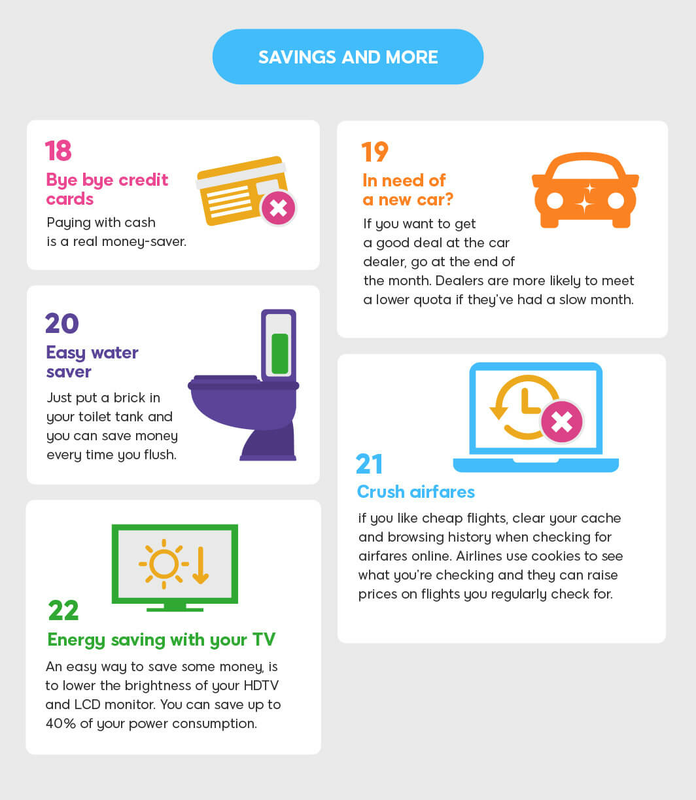 Our team have put their heads together and created a nifty infographic full of fantastic tips and tricks to squeeze more from your spare change, and make that monthly budget stretch that little bit further. How often do you start a DIY project before realising that you don't have the right tool for the job? Your small change could hold the (Allen!) key. 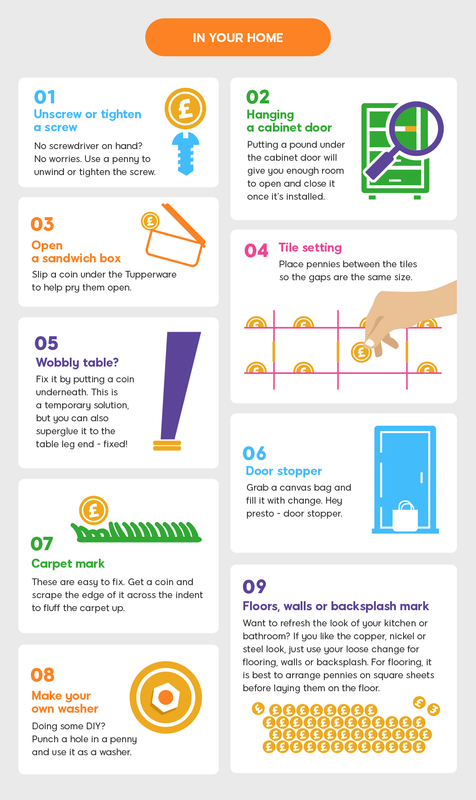 There are tonnes of ways you can make use of pennies when you're fixing up the place; from placing a pound coin beneath a new chest of drawers to make sure the bottom drawer will have enough clearance to open, to using the same width coins to perfectly space out tiles. You can even use pennies to loosen and tighten screws or make your own impromptu DIY washer. If you struggle with jar lids and opening tricky tubs, keeping a couple of coins around is the ultimate way to end the embarrassment of having to ask somebody stronger to help you. Sliding a coin under the rim of a new jam jar lid, then giving it a little jiggle, will break the seal, making it much easier to unscrew. Coins also make excellent levers for opening tough Tupperware containers. If you’re very lucky, you may come across a coin that will allow you to cash in - in the most extraordinary way. One especially rare 2p coin sold for £2,000 in 2016. 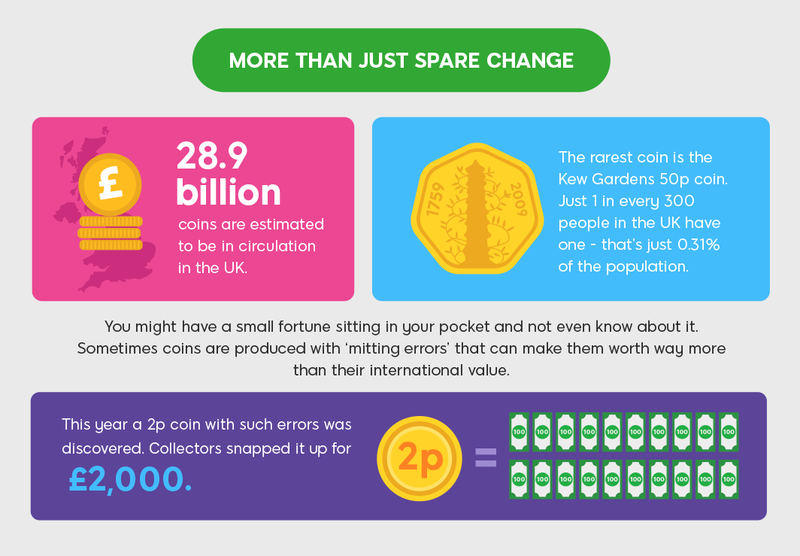 Next time you have a jar full of change, why not read up on valuable versions and check to see whether you're “quids in”? There are just as many uses for spare change outside the home as there are inside. Keen gardeners may already use buried rings of copper pennies around their botanical pride and joys to keep away slugs and snails. Many believe the reaction of copper with slug slime gives the creepy crawlies a nasty shock. If you're suffering from swarms of flies, placing four pennies in a half-full ziplock bag of water is another strange old pest control trick which many people swear by. 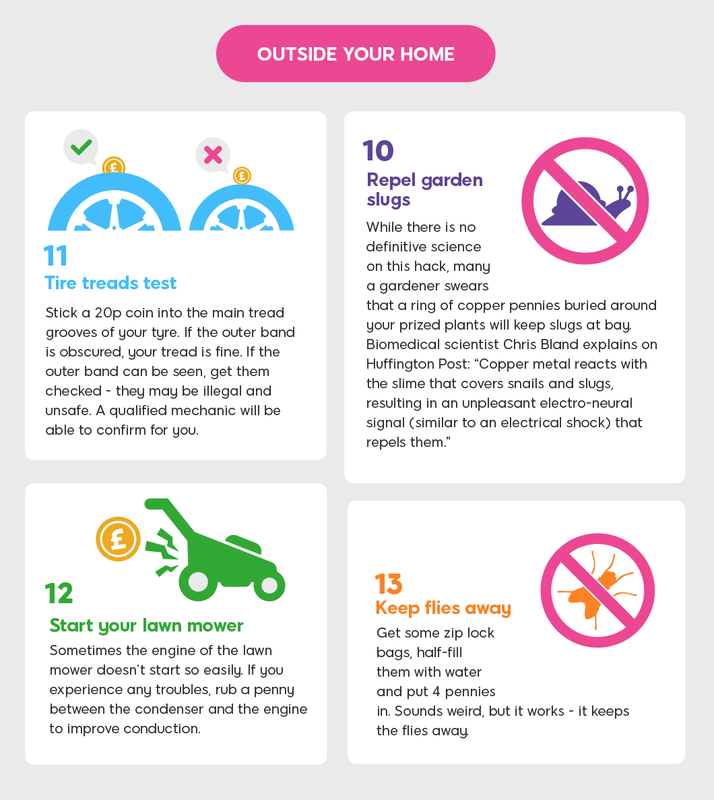 Pennies can even be used to keep your lawn in lovely condition - rubbing a penny between the engine and the condenser can help jump-start even the most stubborn of tired old mowers. Do you love getting stuck into creative projects? Pennies make the perfect malleable craft material for all manner of inventive pursuits. Whether you're creating a splashback protector for your kitchen, an upcycled drinks coaster, a beautiful bowl, a piece of unusual handmade jewellery or cute buttons for a sewing project, these little shiny treasures are the perfect thing for enabling creative projects around the home. Making the edges of your budget stretch that little bit further can feel like an uphill struggle. Monthly expenditures take their toll, and it often feels impossible to turn what’s left into something special. Of course, there are easy ways to prevent unnecessary expenditure and start a more cost-effective lifestyle. Cut up those credit cards and focus on the money that you do have; focus on what’s coming in, what’s going out, and where the savings can be made. It’s incredibly simple to save money on your energy bills. Always check efficiency ratings when purchasing new appliances, and adopt strict water discipline to cut costs. That doesn’t mean sharing bathwater, or anything that Dickensian - tricks as simple as placing a brick or large non-absorbent object in your toilet tank can significantly reduce your monthly tally. It may sound a little eccentric, but it works! 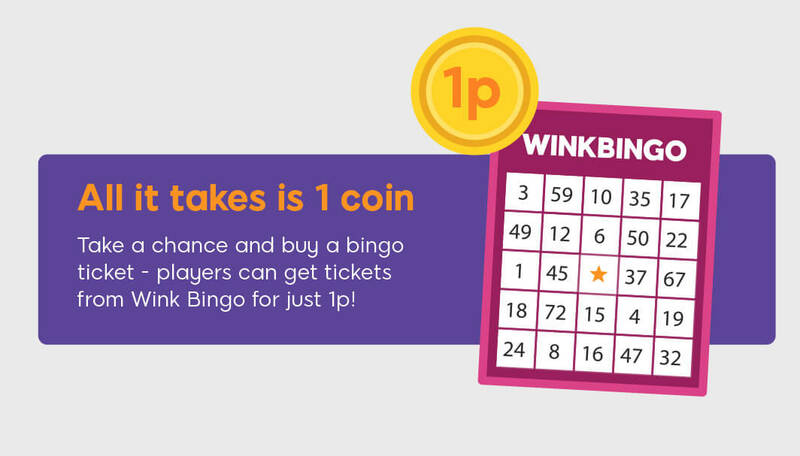 With bingo tickets available from 1p, 10p, 5p or £1, there’s no finer way to turn your spare change into a good time than enjoying a few rounds of your favourite game with Wink Bingo. Enjoy, chat with friends online, and be in with a chance of winning a great jackpot - all with the smallest change in your pocket! 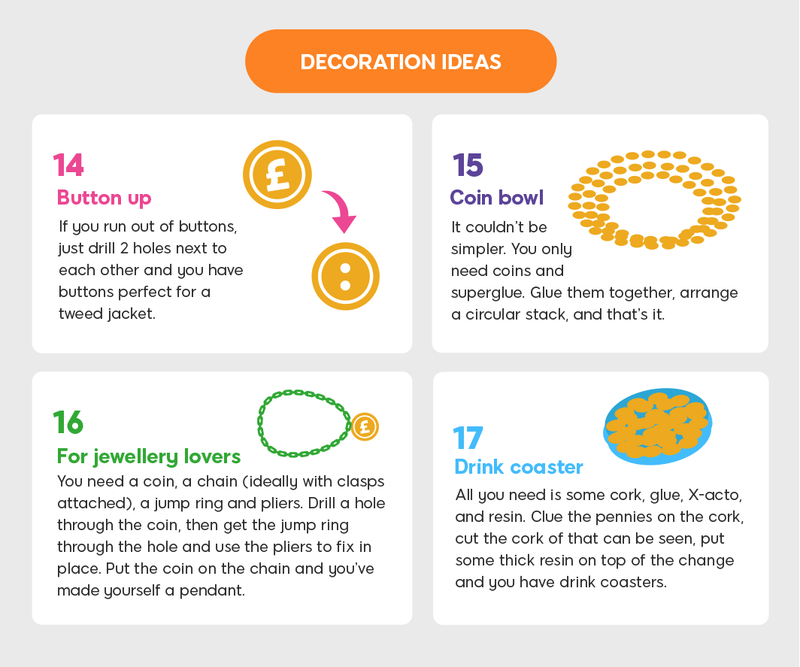 Whether it’s creative or practical hacks you’re looking for, our new infographic is practically jingling with amazing ideas for making your small change into something big!! !